Welcome to the Beijing Xuanwu District Maps Menu at China Report.com / www.DrBen.net. The Below Menu Page gives Quick and Easy Direct Access to Maps of Xuanwu District and Landmarks used in THE BEIJING REPORT, a part of ChinaReport.com. All Maps are published in support of the Information and Photos in our Growing List of Online Reports and Photo-Virtual Reports on The City of Beijing, Its Districts and its many Landmarks, Monuments, Hotspots. Xuanwu District is regarded as the oldest District of Beijing, yet, it was not part of the true Imperial City. There are many smaller and larger landmarks and cultural venues to visit within the Xuanwu District and there are several parks as well. Please check the below Listing for your source Maps. Miao Ying Si or Small White Dagoba Temple - Schematic Site Map, A site map to grounds of the Small White Dagoba Tempe, modest counterpart to the Big White Dagoba of Beihai Park's Jade Island. Find small Miao Ying Temple at FuxingMen NeiDajie due West of BeiHai Park's Northern Entrance. 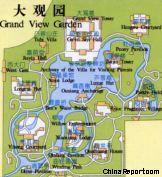 A Site Map to the Small but Famed and Gracious Grand View Garden Park , South West Xuanwu, Beijing.